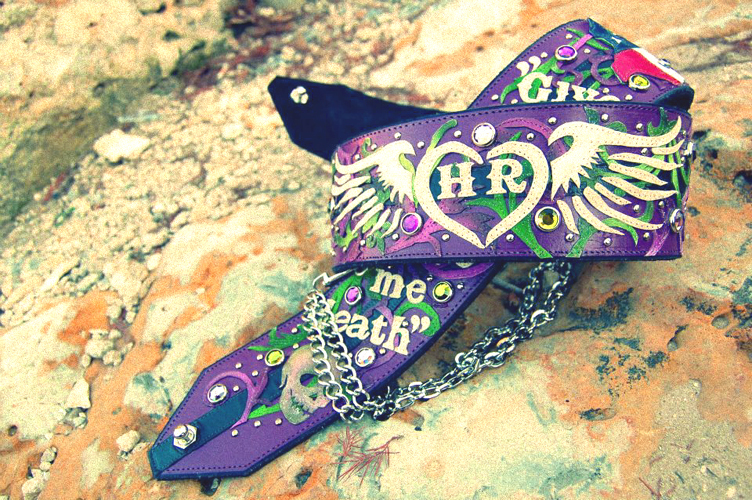 This custom guitar strap was created for the mega-talented Heather Roberts. 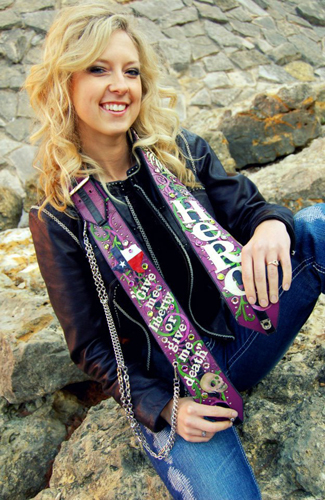 Jeri worked closely with Heather's husband Cisco, to make sure the strap suited Heather's style and had items and symbols with personal meaning to Heather. We started off with a blank piece of belt leather, dyed it black and painted it purple. We beveled the edges to frame the purple with an outline of black. Next, a strip of black kidskin was added up the center of the strap and then completely covered with airbrushed vines in fuschia and shades of green. We then crackle painted kidskin in cream paint to apply Heather's logos and favorite quote. We popped an airbrushed skull on for cool factor! This strap has layers and layers of kidskin overlays, embellished with Swarovski crystals and nickel silver nailheads. Femine, but slick as hell!